Last summer, a group of high school student’s in Syracuse, NY approached us with their idea: Selling ice cream to raise money for local not-for-profit organization Say Yes to Education which provides a range of services to help local children receive a better education, prepare for college and even help with tuition. When the students approached us, we were thrilled at the idea! It’s truly amazing to see youngsters excited and passionate about giving back to their community to improve the future of kids just like them! 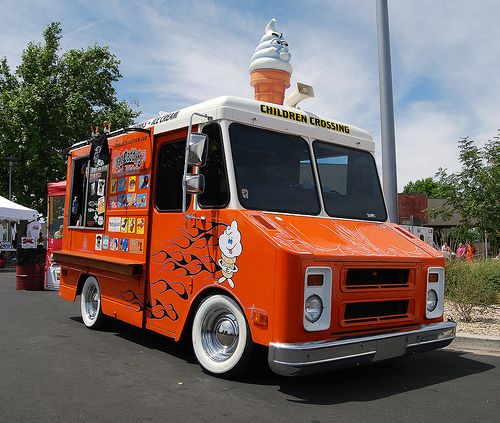 The young activists painted their Ice Cream Truck orange in the spirit of Syracuse since many of the children who are touched by Say Yes to Education in Syracuse will choose to attend a college close to home such as Syracuse University, LeMoyne College or Onondaga Community College. We at Turkey Hill have offered to sponsor the student’s Ice Cream Truck for Charity project again this year, operating in the Syracuse are during the summer months of June, July and August. The Ice Cream Truck will be featuring some of your Turkey Hill products including our Stuff’d Ice Cream, Sports Flavors, Sundae Cones, Ice Cream Bars, and much more! Last summer, the Ice Cream Truck made a profit of $5,000 dollars – all of which was donated directly do Say Yes to Education in Syracuse. This year, their goal is $10,000. Help them reach their goal – Listen for the Ice Cream Truck in your neighborhood and invite the team to your local events!